Makeblock as developed a new coding robot aptly named the Codeybot which has been specifically designed to provide a way to teach youngsters more about coding and what can be accomplished with a little robotics knowledge. The Codeybot come supplied complete with its own companion smartphone and tablet application and is capable of dancing, playing music and even shooting lasers if programmed to do so. The coding robot is fitted with a display that allows it to show a wide variety of different icons and signals to provide feedback when required. Check out the video below to learn more about its specifications, design and coding features. The developers of Codeybot explaining little more about its construction and inspiration. Meet Codeybot! From the experts at Makeblock, Codeybot is an educational robot who teaches basic programming through an array of interactive features. Have fun coding Codeybot’s LED display, or programming a route, dance or adventure for him to take using our own, Codeybot and mBlockly programming language*. He inspires fun and learning through his LED drawing panels, feeds entertainment to daily life with all his customizable features, and encourages connectivity through his wifi music speakers, dancing capabilities, and battle mode. Codeybot seamlessly turns the code-learning process into something natural and visually comprehensible. Get ready to program the fun! 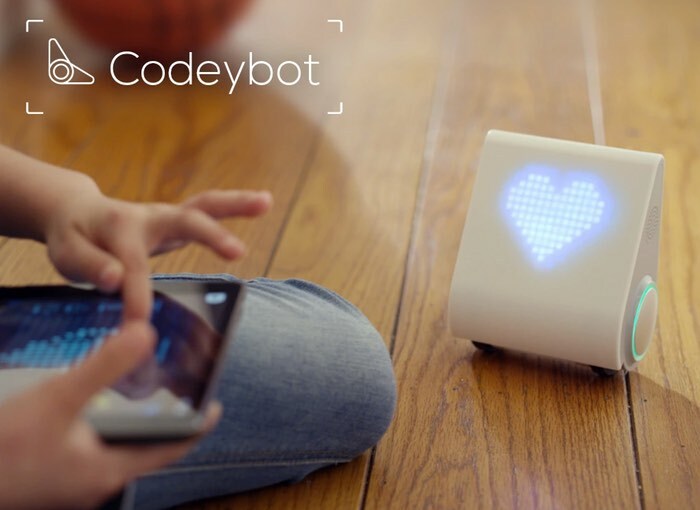 The Codeybot coding robot project has launched via the Kickstarter crowd funding website looking to raise $100,000 in pledges to make the jump from concept to production. So if you think the Codeybot coding robot is something your family or school could benefit from, visit the Kickstarter website now to make a pledge and help Codeybot become a reality.